Results for the AGS Awards 2006 are out. The wiki site has been updated with all nominees. Project Aon updated with two new additions. All four books from the Combat Heroes series are now available as free PDF downloads. Information about a new project was posted over at the Acoders' web site. 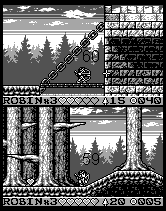 Wolverine is currently developing a platformer for the Retro Remakes mini compo, featuring Robin Hood and his group of merry men. Thanks for your posts. I'm sorry to make you all wait. The shooting game is slowly coming along. As usual, I'm resisting the impulse to show it to people early. There are a number of reasons that I can't release a half-done version: I wouldn't be able to keep up with the number of player requests that would come from players using a work-in-progress version, and it would also risk ruining players' first impressions.